Nick Matthew is refusing to underestimate the threat Chris Simpson will pose in the first round of the AJ Bell British Squash Grand Prix, claiming the Guernsey player is the future of English squash. The 35-year-old, second in the world rankings, returns to action tomorrow, opening up his his season with a clash against world No.22 Simpson at the National Squash Centre in Manchester tomorrow. Second seed Matthew, who recently recovered from knee surgery, is seeking to defend his title in a star-studded field, featuring close rivals Mohamed Elshorbagy and Gregory Gaultier. 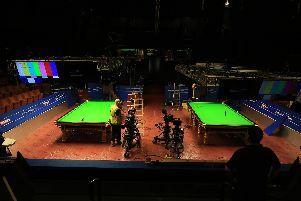 But the three-time world champion is acutely aware he can ill-afford to take Simpson lightly. The Sheffield ace told The Telegraph: “Chris [Simpson] is at that stage in his career where he’s 28, is near the top 20 in the world and is going to want to push on to the top 10. Away from the court, Matthew and Simpson are good friends. They both train at the English Institute of Sport and work with strength and conditioning coach Mark Campbell. “It is a double-edged sword playing against Chris,” admitted Matthew. “He is a regular training partner. “We know each other’s games inside out so there are not going to be any surprises when we play each other. He will not be worried when he steps on court to face me because he trains with me every week. “He knows that I won’t be coming in with ideal preparations and that I am there to be shot at so it will be an incredibly tough first round. Should Matthew prevail, he could face long-time adversary James Willstrop in the quarter-finals while talented Colombian Miguel Angel Rodriguez is a possible last four opponent. Top seed Elshorbagy and Frenchman Gaultier, meanwhile, are in the top half of the draw. On his aspirations for the new campaign, Matthew said: “I don’t have any expectations really other than staying injury free. I want to enjoy the processes again and enjoy being back in the tournament fold. “If those things happen, then hopefully the performances and results take care of themselves. I am certainly not putting any pressure on myself. After the Grand Prix, which takes place between September 11-14, Matthew will fly out to America to compete in the in the Net Suite Open in San Francisco followed by the U.S. Open in Philadelphia.